What can a Kleiner Perkins VC pitch, and Hamburger Helper from General Mills, tell you about how to make your ideas tangible and real? We continue our Leadership Hall of Fame series, a year-long look at the top business books and authors, with an excerpt from Made to Stick (2007) by Fast Company columnists Dan and Chip Heath. Valley–is more like a private one-on-one audition with Steven Spielberg. the biggest chance of your life. at Stanford who had quit to work at Lotus in its early days. blank pad of paper inside. This did not bode well. When Kaplan’s turn arrived, one of the partners introduced him. had little to lose, I decided to risk some theatrics. of the table where it landed with a loud clap. sort of talisman. He asked the first question. John Doerr [another partner] answered before I could respond. nonexistent company at $4.5 million. and critical to active and creative. Concreteness creates a shared “turf” on which people can collaborate. talk that puts them on common ground. needs of specific people: our readers, our students, our customers. Mills in 2004 as Hamburger Helper’s brand manager. needed to have a picture of the brand’s customers at their fingertips. had a toddler on her hip while she was mixing up dinner on the stove. needed to resist this push. “Moms saw new flavors as risky,” she says. year 2005, Hamburger Helper’s sales had increased 11 percent. 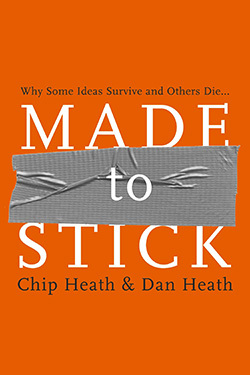 This article is excerpted from the book Made to Stick: Why Some Ideas Survive and Others Die, written by Chip and Dan Heath. Chip Heath is the Thrive Foundation of Youth Professor of Organizational Behavior in the Graduate School of Business at Stanford University, and Dan Heath is a Senior Fellow at Duke University’s CASE Center, which supports social entrepreneurs. The Heath brothers’ new book, Switch: How to Change Things When Change Is Hard, was released in 2010 and debuted at #1 on The New York Times bestseller list. For free resources related to both books, see heathbrothers.com. Read more about Made to Stick or our Leadership Hall of Fame.